Good kill (n.) - eliminating a target in an efficient, contained manner. 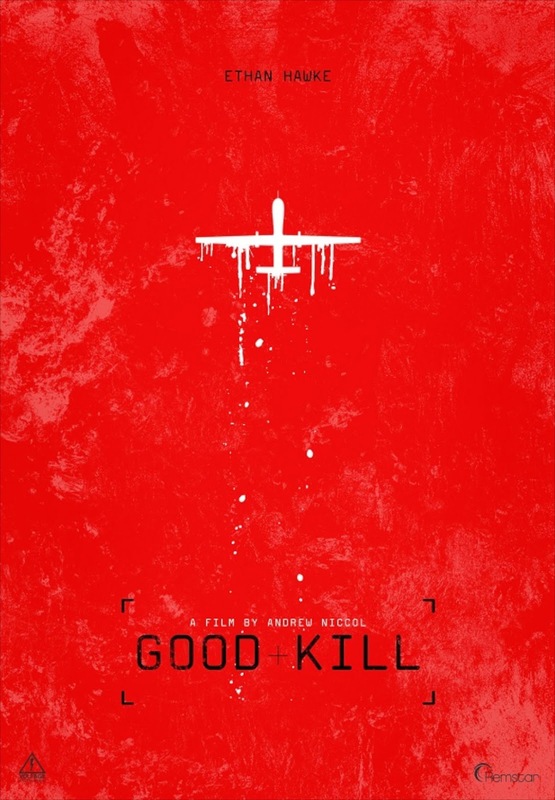 Good Kill is a film that examines the drone warfare from the point of view of Tommy Egan (Ethan Hawke). Egan is an airman with a rapidly deteriorating state of mind, and while he longs to get back in the cockpit of a fighter plane, his commanders assign him to drone duty. It's quite the culture shock, since he now spends his days sitting at a computer just outside of Las Vegas. Struggling with his own personal demons, he is also surrounded by a changing Air Force. Egan misses flight, but his baby faced compatriots have never set foot in a fighter. New recruits forgo traditional air training to learn drone warfare, which is fundamentally the same as operating an arcade cabinet. In another type of film, a drone pilot wearing full flight gear would be played for extreme irony. There is a certain irony to going home and barbecuing after spending 8 hours mentally in a war zone. A title card informs the audience that the US escalated drone strikes against terrorists in the Middle East in 2010. The film takes place in this 2010 surge, and attempts to dramatize the questions surrounding drone use. Throughout the film, characters differentiate between killing known, verified terrorists and unknown individuals who fit the profile of "suspicious behavior." In some cases, they may be killing first responders and in others they are not allowed to "terminate" individuals committing severe crimes in the light of day. Egan feels most fulfilled when he can provide overwatch to soldiers as they make their way across hostile territory. Despite facing no immediate danger, this work takes a toll on several of the main characters. Egan displays elements of PTSD, and his co-pilot Vera (Zoe Kravitz) develops conscientious objection to her work. The film's message is heavy handed at times, almost as if the filmmakers didn't trust the audience to understand it. It seems a little bit incredulous that enlisted members of the Air Force would talk openly debate their reservations with commanding officers. This happens not only when they are given a controversial order, but also during mission briefings and even at the lunch table. Director Andrew Niccol has always grappled with big ideas in his films, even though his tween-centric blockbusters released in the last few years. He returns to real-life and real consequences in Good Kill, and it's a welcome return. Though it lacks the visual panache of some of his other films, Good Kill is primarily focused on ideas and character. While Good Kill is occasionally heavy handed, it does raise the question of how and why drones are used. Since, as one character put it, drones aren't going anywhere... they're going everywhere, this film couldn't be timelier.